While this is not the most flattering photo, I have to share this recipe. 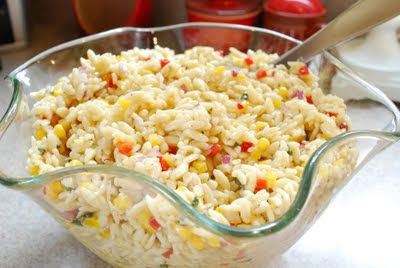 I made this orzo salad for the birthday party last week and people couldn't stop talking about it. While it's a copycat recipe based on J. Alexander's Orzo and Wild Rice Salad, I had to make a few adjustments. See, I love to plan parties and stuff, but I do tend to get stressed out..ok, a bit over stressed. Even though I make list after list of things I need, I inevitably leave something off. This time it was the wild rice. I might have stressed out a bit over it, but then I figured I could do without it, since eating wild rice is like chewing on tiny brown expensive twigs. I think it turned out just fine. *Note: The below measurements are what I used for the party to feed 25 people. Cook orzo according to directions on package. Drain and then let cool for about 30 minutes. Add the rest of the ingredients and toss. Make dressing. Put all the ingredients, except both oils, in a medium mixing bowl. Stir until combined. Vigorously stir the mixture while slowly adding the oils. Once combined, pour over cold orzo/vegetable mixture and stir to coat. Refrigerate. Best served cold. Om nom nom! This salad was amazingly good. I could seriously eat a vat of it and not complain. Definitely on my "to make" list! que blog mas bonito, si tienes un rato te invito a visitar el mio.